OAKLAND, CA (KTRK) -- The Warriors Stephen Curry is the first ever unanimous winner of the National Basketball Association's Most Valuable Player Award in league history. 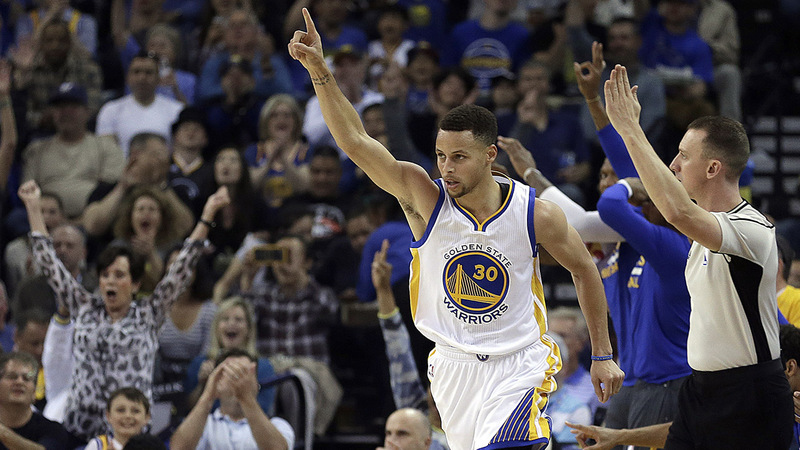 The honor comes as no surprise, as Curry has been the front-runner since early in the season. The only drama remaining is whether he will become the first player ever to win the award unanimously. "I kind of felt bad today because I didn't tell him congratulations because I felt like I knew since December," teammate Draymond Green told reporters at a shootaround before Game 4 of Golden State's second-round series at Portland. "It didn't feel like this momentous occasion. It didn't feel that way." Curry returned from a sprained right knee on Monday and scored 40 points, including an NBA-record 17 in overtime, as the Warriors took a 3-1 lead in the series with a 132-125 victory over the Blazers. Curry had been out since he was injured in Game 4 of the first-round series against Houston. "He's the MVP, he's a killer, he's everything, all the names, silent assassin, all that, to come out and perform like he did tonight and get that MVP tomorrow," teammate Marreese Speights said. Curry led the league with 30.1 points per game and shattered his own record for 3-pointers by making 402, becoming the first player in league history to top 300. But Curry is more than just a scorer. He averaged 6.7 assists and 5.4 rebounds, led the NBA with 2.1 steals per game, while shooting 50.4 percent from the field, 45.4 percent from 3-point range and 90.8 percent from the foul line. More than the numbers, Curry put on a show almost every night during Golden State's record-setting season that started with 24 straight wins and ended with the Warriors breaking the single-season wins record of 72 set by Chicago in 1995-96. With range that extended to halfcourt - and sometimes even beyond - and the ability to create space for his own shots with his ball-handling and opportunities for his teammates by the way he stretched the floor, Curry made the Warriors' offense click. Perhaps no player has ever had that combination of traits in NBA history. Curry has done it with a baby-faced look and a 6-foot-3, 190-pound frame that led coach Steve Kerr to say that he is able to dominate while looking like "he could be your little brother." "The way that I play has a lot of skill but is stuff that if you go to the YMCA or rec leagues or church leagues around the country, everybody wants to shoot, everybody wants to handle the ball, make creative passes and stuff like that," Curry said after winning AP Male Athlete of the Year earlier this season. "You can work on that stuff. Not everybody has the vertical, or the physical gifts to be able to go out and do a windmill dunk and stuff like that. I can't even do it." Curry has become one of the world's most intriguing and popular athletes, playing golf and doing public service announcements with President Barack Obama. "It's amazing to be on a team with a guy like that," Speights said. "He's so humble. You'd never know he's that type of guy but that's something we all respect about him." He was the first Warriors player to lead the league in scoring since Rick Barry's 35.6 scoring clip in 1966-67, joining Barry and Wilt Chamberlain as the only players in franchise history to average 30 or more points in a season. "He's incredible. He's different. He's something that we've never seen before," said Allen Iverson, the 2001 MVP. "We've never seen this. It's crazy to me. Just me being the biggest Michael Jordan fan, to see somebody come around like this, I have my idea of being incredible, you know what I mean. But this dude right here!? It's different. It's a whole different monster."